At the center of your tooth is pulp. 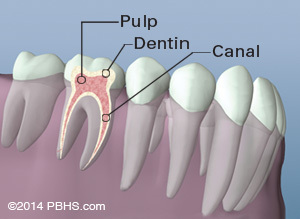 Pulp is a collection of blood vessels that helps to build the surrounding tooth. Infection or inflammation of the pulp can be caused by trauma to the tooth, deep decay, cracks and chips, or repeated dental procedures. 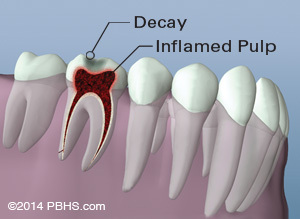 Symptoms of the infection or inflammation can be identified as visible injury or swelling of the tooth, sensitivity to temperature or pain in the tooth and gums. If you experience any of these symptoms, your dentist will most likely recommend non-surgical treatment to eliminate the diseased pulp. 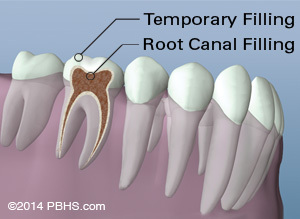 This injured pulp is removed and the root canal system is thoroughly cleaned and sealed. This therapy usually involves local anesthesia and may be completed in one or more visits depending on the treatment required. 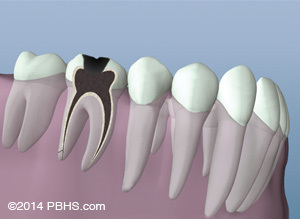 Success for this type of treatment occurs in about 90% of cases. 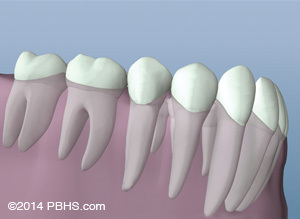 If your tooth is not amenable to endodontic treatment or the chance of success is unfavorable, you will be informed at the time of consultation or when a complication becomes evident during or after treatment. We use local anesthesia to eliminate discomfort. In addition, we will provide nitrous oxide analgesia, if indicated. You will be able to drive home after your treatment, and you probably will be comfortable returning to your normal routine. We also offer conscious sedation, however, a consultation for this must be completed prior to treatment. Also, a driver will be required, as well as supervision for the rest of the day. For more information, please contact our office at Beaumont Office Phone Number 409-866-4600.